The quality of a stage to screen adaptation can vary wildly, as the two mediums are as closely related as the are distantly connected. They are like brothers that stuck together in infancy into early childhood and then started to slowly go their separate ways, one staying in the same little town for his entire life, building strong roots, cultivating relationships and strong human connections, while the other wants to see the world, travelling all over the globe sampling the spectacular sights and sounds, never staying in one place for two long. Second Lietenant Raliegh (Asa Butterfield) arrives at his new post at the front. R.C. Sherriff's classic play has been adapted for film before, both as direct adaption in the 1930's and as inspirations for Aces High with Malcolm MacDowell and the brilliant BBC comedy Blackadder Goes Forth. Set in the British trenches of World War I near Saint-Quentin, the story takes place over the short yet seeming endless period of 18 March 1918 to 21 March 1918. Second Lieutenant Raleigh (Asa Butterfield) is a young and naive officer who has just arrived to joins the company, having requested the posting in order to serve under his old school chum and Rugby skipper, Captain Stanhope (Sam Claflin.). Stanhope is in a relationship with Raleigh's sister Madge, and Raleigh remembers him as a terrific fellow and older brother figure. But the Stanhope he finds when he gets to the trenches is a battle weary officer who has taken to drinking heavily to cope with the intense stress the war has put him under, and he is less than thrilled to see young Raleigh in this Godforsaken place, but because it means the young man's life expectation is significantly reduced and because he does not wish for anyone, least of all the little brother of the girl he left behind, to see him as he is now. Lieutenant Osbourne (Paul Bettany), an older man (relatively speaking) and former school master, is the calm (relatively speaking) voice of reason in the group, looking out for everyone, from Raleigh to his troubled mess of a Commanding Officer. 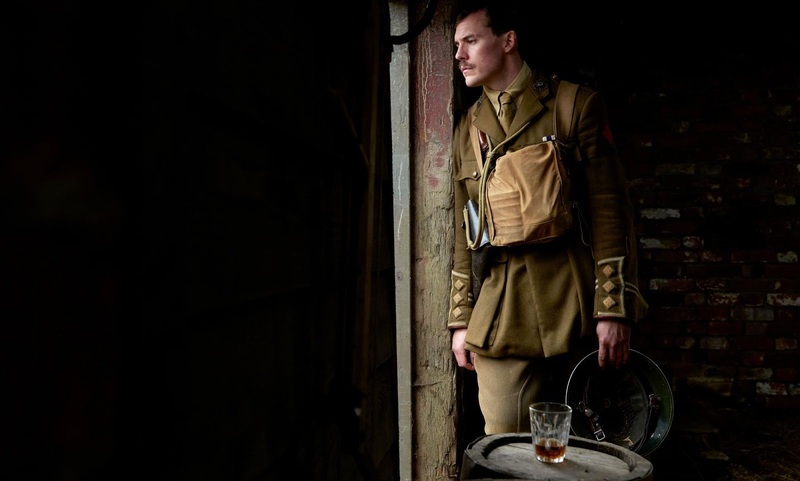 Capatian Stanhope (Sam Claflin) looks out on the trenches. Private Mason (Toby Jones), the cook, often forgets about ingredients and key parts of the food that he prepares for the officers, and Second Lieutenant Trotter (Stephen Graham) is a rotund officer commissioned from the ranks who likes his food; he can't stand the war and counts down each hour, while Second Lieutenant Hibbert (Tom Sturridge) talks incessantly about women and drinks almost as much as Stanhope. The motley assortment of men are stuck together in the same place physically yet far distanced from each other in mind and spirit, each dealing (or not dealing) with a frightening present and potentially dismal future in their own ways. As with any character oriented stage play, the performance make or break the whole thing, and there isn't a false moment here among the magnificent cast. Claflin, a rising star who got off to an iffy start with his underwritten role in Pirates of The Caribbean: On Stranger Tides but made a much stronger impression in the Hunger Games series, gives easily his best film performance to date, masterfully juggling the complexities of the character, and the only thing that makes it difficult to characterise the film as truly belonging to him is the shining work by Bettany, a great actor who hasn't had this strong a vehicle to remind us of his quiet, dignified presence in a long time (not to take away from his delightful work as Vision in the Marvel films, but this is in a different hemisphere.). Toby Jones, an actor who practically defines the word "nuance", is sublime as the haggard cook (a lesser performance would leave you constantly distracted by thoughts of the memorably disgusting parodies of this character with Baldrick on Blackadder. ), but Jones makes him sympathetic and gives a dignity to in his important but thankless lot that feels genuinely noble. Butterfield gives a capable performance, but is the least interesting character by virtue of being the least enigmatic. He serves more as a point of view for the audience than anything else. 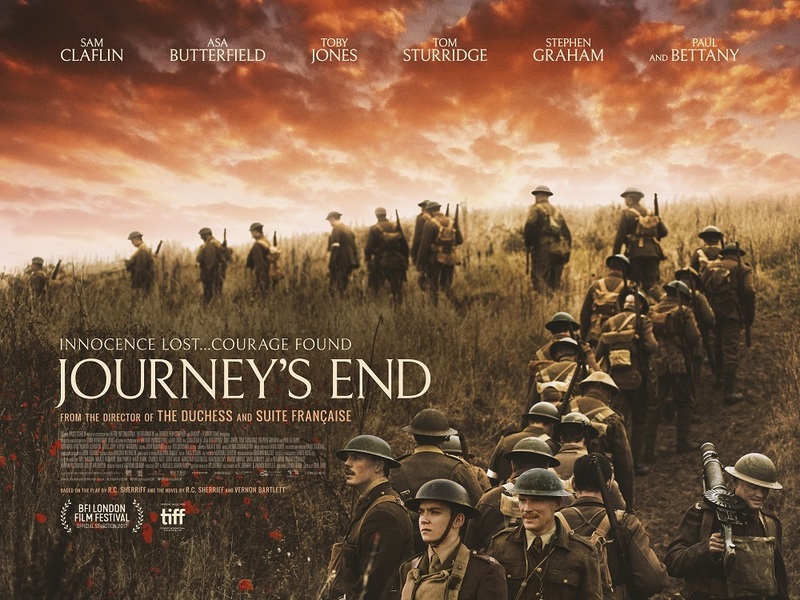 Journey's End won't be remembered at Oscar time, despite universally strong reviews, partly because it's so small compared to most modern war epics, and because it's just not generating enough buzz (and it doesn't help that the generic, Flight of the Intruder style tag lines used in the advertising are misrepresenting the film.). But it's a great film nonetheless, and its a sobering reminder that the horrors of war come in many subtle varieties.